"The stunning Raj Niwas Palace in Dholpur is located in the midst of verdant lawns frequented by peacocks. The all suites heritage hotel offers such views and more to its esteemed guests, coupled with an unmatched heritage holiday experience. Dholpur was known to be a colony of the British East India Company from the year 1779. It is believed that Dholpur Palace was constructed for welcoming HRH Albert Edward, when he visited India in 1876. 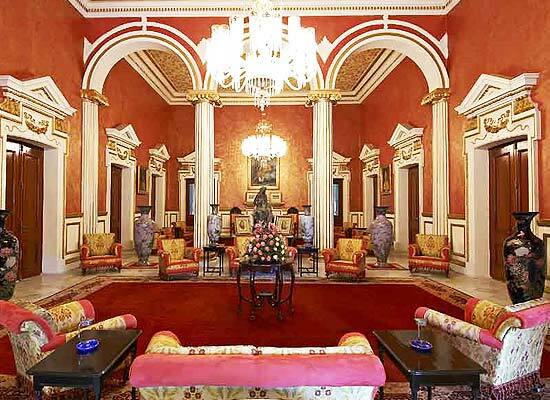 Also known as Raj Niwas Palace, this beautiful palace is known to have a rich and colorful history. Today, it is one of the best heritage hotels in Dholpur. 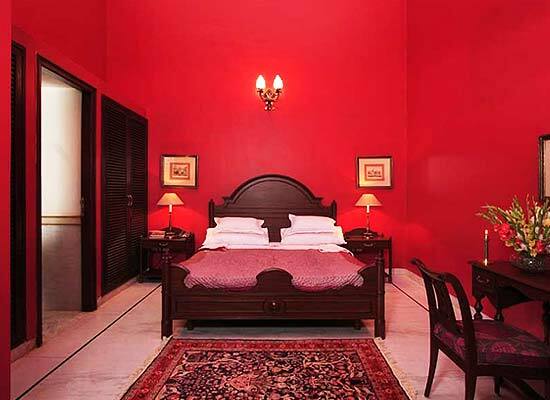 The magnificent Rajasthani architecture and décor have been opulently refurbished. The red -color sandstone edifice and Dutch ceramics look striking. 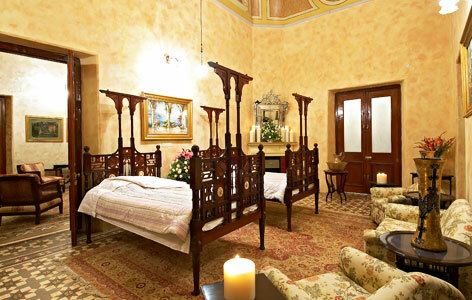 Spread in a landscaped garden of 13 acres, Raj Niwas Palace has a total of 40 rooms segregated into categories. Travel back in time while admiring the flawless hospitality, world-class facilities and regal décor of the rooms and suites. The Heritage Wing of the property oozes grandeur and style through its Persian carpets, carved pillars, ceilings and moldings, gold and cream ornamented stucco, artifacts belonging to the 19th century from Europe including Victorian baths, Belgian glass, Grand piano in satinwood, antique brass-switches, mosaic floor, and so on. Positioned amid well-maintained gardens, these rooms are the latest addition to the accommodation and are spread in an area of 1000 square feet. There is a common verandah for all the rooms which lets the sun lights and cool breeze from the trees to come in. These spacious rooms are well-appointed with all the modern comforts and have elegant interiors. The exquisite furniture adds to the charm of contemporary comforts including a king size beds. Very spacious, Palace Suites are located in the heritage wing of the hotel. The décor is inspired from the traditional design themes and comprises of walls with ceramic tiles, plaster work in gilded ceiling and floor with a mosaic of colored oxide tiles. This royal interior is complimented well with modern luxuries found in the suites. The spacious pool villas come with air-conditioned (hot and cold), king-size beds and cascading windows with wonderful views. The villas spreads in an area of 1500 square feet and has all the contemporary facilities and amenities. Just like the bedroom, the sitting room is equally well-appointed and stylish. A personal Plunge pool is one of the best features. Antique furniture is another highlight. Consisting of a huge living area, two bedrooms, and a private plunge pool, the Presidential suites are perfect for a family of four. Fully air-conditioned (hot and cold) villas have king-size beds, cascading windows, along with all the world- class facilities and amenities. Admire the chic interiors and exquisite furniture during your memorable holiday. The hotel has a multi-cuisine restaurant where the guests can savor lip-smacking delicacies of Indian and popular World cuisines. Highlights are those recipes which are brought straight from the royal kitchen by the trained chefs. Meals are prepared by freshest of ingredients and aromatic spices. The food and drink options in à la carte are endless and buffet during breakfast is lip-smacking. 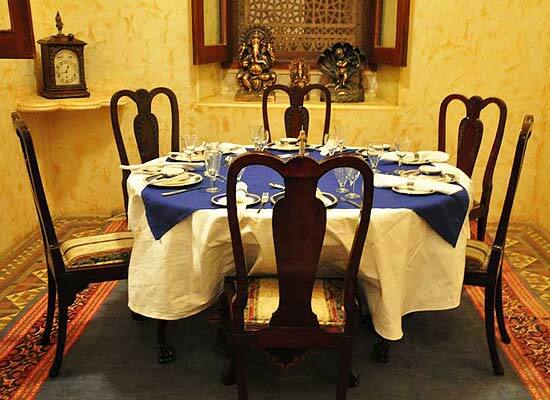 Special meals can be arranged at other venues like garden or courtyard, on demand. Formerly the capital of the princely state of Dholpur, the city is located in the eastern part of Rajasthan. Dholpur is worth a visit for its splendid tourist attractions such as Muchchhkund, Laswari, Shergarh Fort, Talab Shahi, and the Shiva Temple.